I have many options to choose from and am working on expanding the selections continually! If you don’t see the color or strobe pattern that you are looking for, contact me to check for availability. Any of the LED options can be used in ANY pattern! 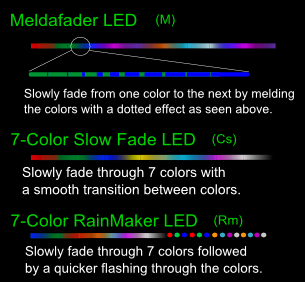 You can setup the exact placement of each LED or let me know which ones you like and I can create a layout for you. 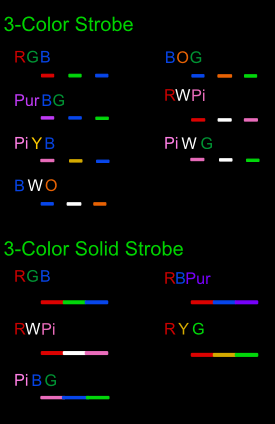 See below for letter/color definitions. 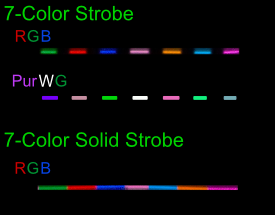 Some LEDs may be available in limited quantities and subject to a short wait for restock or use of an alternative LED. Whats your style? Are you interested in symmetry or do you want to go a little more chaotic? There are many possible patterns and I encourage your imagination to take the lead. Feel Free to contact me with any questions. LED Key – Use the following simple representation for each LED to list your pattern. Other patterns can be created that appear symmetric but not even. For instance: RRRGGBVG repeated 3 times around the hoop or BBGWGBBV repeated 3 times around the hoop. Alternate Every 1 LED: C1 C2 C3 C1 C2 C3…. Alternate Every 3 LED: C1 C1 C1 C2 C2 C2 C3 C3 C3 C1 C1 C1…..
Alternate Every 8 LED: C1 C1 C1 C1 C1 C1 C1 C1 C2 C2….. The above alternating patterns are for 3-color patterns but I hope it gives you some ideas for how they can be arranged. Any number of colors can be used in any pattern you can dream up! Feel free to submit your own pattern in any form!